If you are looking for DOOOOOM, you are looking in the wrong place. This morning's report on industrial production confirms that the economy remains on autopilot, and that's a good thing. While it's true that the manufacturing subindex is below its April peak, I am not terribly concerned. There were very volatile readings in March, April, and May, and if we smooth the readings out via a three month moving average, July is only slightly below June, and both June and July are above every other 3 month average reading. So the Doomers will have to move on from their "soft data/hard data" argument to something else. Below is a photograph of the World War Two Memorial on the National Mall in Washington, D.C.
Keep it in the back of your mind. I'll return to it. I am a data nerd, and leaping to conclusions about data is a pet peeve of mine. I really hate it when anyone, and particularly my own side, falls for groupthink, jumping to instant conclusions which then become the only acceptable opinion. In the last 48 hours, without consideration of other possibilities, or looking for contrary vs. corroborating data, it seems that just about everyone on the center and left has become an instant expert on the fact that Confederate statues were erected because of Jim Crow. 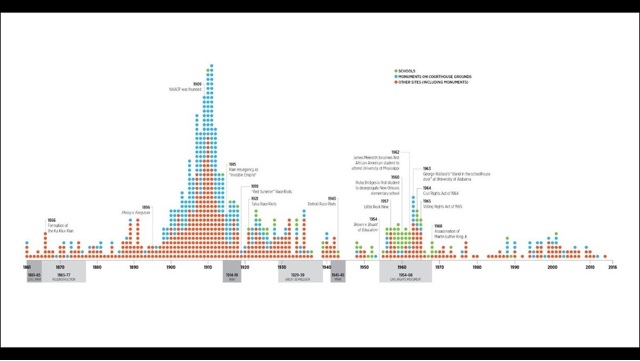 So, has it occurred to nobody that there might be a more straightforward reason why there would be a huge spike in Memorials (cough, cough, hint, hint) ***50*** and ***100*** years after the Civil War? Yes there were a number of racial incidents that occurred in the 1910s. But before the last 48 hours, the general consensus was that there was a resurgence in violence associated with white supremacy in the 1920s, not the 1910s. But 1910-1915 marked 50 years sine the Civil War, and those 20 year old soldiers who fought it had dwindled to a band of 70 year old men, who did not want themselves or their cause to be forgotten after their generation had passed. In our own time, we have had a demonstration of the exact same psychology: the World War Two Memorial shown at the beginning of this piece was championed as the 50th anniversary of the war approached, as a monument to the "Greatest Generation," particularly by veterans such as Bob Dole who did not want their sacrifice to be forgotten after they shuffled off to the Last Great Muster in the sky. 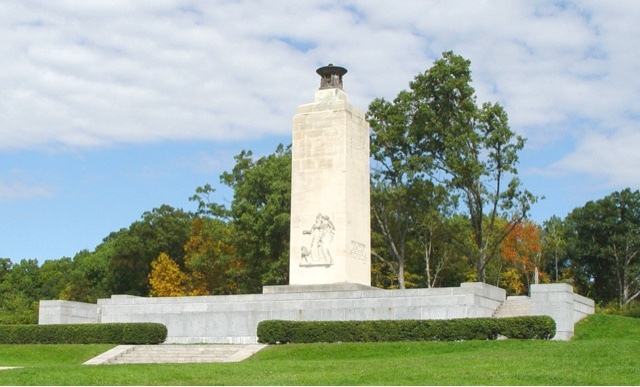 Bill Clinton signed the authorizing Act for the memorial in 1993. I am sure speeches were made lionize Jim Crow when the statues were dedicated, and none of this affects the debate on what should become of them. But can our side please not succumb to leaping to conclusions? Here's a good test: when were monuments to Union soldiers and leaders erected? I haven't found any information onlline on that subject. Was there a similar spike in the vicinity of the 50th anniversary of the Civil War? If there wasn't, then there was something "special" about what the South did. But if there was, then the more straightforward explanation is probably the correct one. This morning's report on July retail sales once again belies the claim that "hard data" and "soft data" are divergent.. In fact, real retail sales look like they are right in line with a multi-year trend. Again, the upward trend is continuing . .So this suggests that recent stronger monthly jobs reports will continue. Doomers will once agin have to find a new place to hang their hats. This puts him below the lowest ratings during their entire term of Lyndon Johnson, Ronald Reagan, and Bill Clinton. Only Truman, Ford, Carter, and George W. Bush ever scored lower. So far, alas Rasmussen has not followed suit. How close are we to full employment? 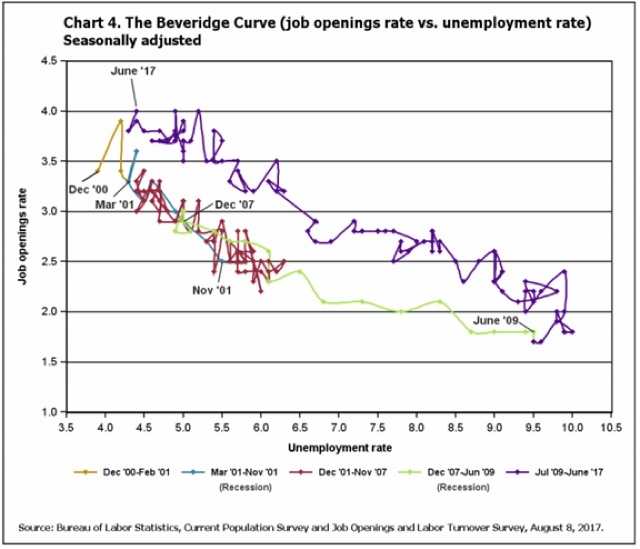 One method that is sometimes touted is the Beveridge curve. The Beveridge curve (invented by a British economist named, you guessed it, Beveridge, compares the level of job openings with the level of unemployment. Generally speaking, if there are as many job openings as there are unemployed, then the economy is running at full employment (since everyone who wants a job ought to be able to get one). The unemployment rate, at 4.3%, is only 0.3% above the job openings rate, at 4.0%. Of course, another way to look at the data is that it has taken many more job openings to get us down to 4.3%, compared with the last expansion at least. But as I have frequently noted, this assumes that job openings are offered in good faith. If employers are just trolling for resumes, or laying the groundwork for H1-B slave labor visas, then job openings aren't offered in good faith. I think we have to measure employers not by their words (advertising openings), but by their deeds (actual hires). Note that at the end of the late 1990s boom, we really were at full employment. The ratio of both openings and hires to the unemployment rate was close to 1:1. Pretty much everyone who wanted a job could be matched with one. The 2000s economy never got to that point. While the current economy looks like it is at full employment measured by openings, measured by actual hires there is still slack, as there are only 8.5 hires for every 10 people who are unemployed. Here the relative comparison is considerably worse. While the ratio of job openings to the underemployed is close to its 1990s boom level, the ratio of actual hires to the underemployed isn't even close -- and hasn't reached the peak of the 2000s economy either. Needless to say, I think the most reliable measure is based on deeds rather than words, and measured by deeds, we aren't at full employment, let alone a boom. "[T]he Democrats have, what happened is that some years ago they decided they didn't want to be the party of the people anymore. They didn't want to be the sort of traditional Democratic Party that I grew up with, the party of Roosevelt, Truman, Kennedy, Johnson. That's not what they wanted to be. "[T]he Democrats, as they moved away from their old working class base and they treated them very poorly and they did the same with other essential elements of their constituent groups, minorities for example ... [W]hen they did things like got NAFTA passed which was really hard on working class people, when they did those things they used to have a saying. They'd say, 'Well you know we don't have to worry about that. Those people have nowhere else to go.' Nowhere else to go. This was a Democratic saying in the 1990s. "Trump gave those people somewhere else to go." "They speak with pride of having promoted more open and efficient government, of being more accessible to the public, of maintaining their “independence” from the established party organizations, and of their opposition to the spoils system." That was exactly my recollection of the then-young Democrats described in the book. They eschewed New Deal style economic programs, and the unions and big city machines that delivered the electoral victories that made those programs possible, in favor of social equity, and an economically "efficient" streamlined government, that would produce a meritocracy which would be accepted as fair by all. As it happens, I still have my copy of "Changing of the Guard," so I went back and re-read parts of it, especially the interviews with people like then-Governor Bill Clinton who went on to more prominence. (Obama was a teenager in high school in Hawaii at the time, so no interview with him!) Keep in mind that all of the quotations you read below are from almost 40 years ago. "Organized labor found itself falling out of comfortable collaboration with other elements of the New Deal coalition [over social justice issues]." Younger readers may not know this, but one of the chief sources of that falling out was that nepotism was rampant in trade unions. An older member getting a spot for his son or perhaps a nephew or two was not uncommon. Affirmative action or racial quotas meant that some of those family members were rejected in favor of African American applicants. Older union members bristled, to say the least. "[T]he young Republicans' aversion for federal policy making was more than just a rhetorical bow to [conservatism].... Both of the men who served as Jerry Ford's White House chief of staff, Donald Rumsfeld and Richard Cheney, said they had become more conservative in their outlook as a result of what they had seen in Washington. "Rumsfeld echoed the same skepticism...."
"I said, 'I'll tell you what's happened to me,' Du Pont said, 'I've had to go back to Delaware and live under this federal bureaucracy, and I think it has made me very much more hardheaded, considerably more conservative and very antagonistic to what the federal government is constantly forcing me to do. My schools are being run by a federal judge. My prisons are being run by a federal judge. Construction for a new hospital ... has been delayed a year and a half because of federal judges' fiddling around with various lawsuits.... I mean the red tape and the morass and the harassment from Washington is endless ...."
"But the people pressing for change were not only Republicans. Many of the younger Democrats were as impatient with the formulas of the New Deal-Great Society era as any GOP critics.... [lambasting the older generation of Democratic politicians] for not confronting ... the need for improved government efficiency and relief from the 'overregulation' of society." "Hart was cold-blooded in rejecting the New Deal policies of the past... in what turned out to be an accurate preview of the economic and social-policy revisionism of many of the young Democrats elected to Congress in . They have been far less sympathetic to organized labor, and far more concerned about middle-income taxpayers." "He is married to an ardent feminist who has kept her maiden name, Hillary Rodham, and her own law practice in Little Rock." "Clinton [was] elected as governor[ ] in 1978 on [a] platform[ ] stressing ... measures to improve the laggard education systems in their states. "Southern politicians see conservative fiscal policies and sound management as a precondition for gaining public support for the social-welfare programs they espouse." "'In Arkansas [...] there's probably a hard-core thirty percent that is always going to vote for the more conservative of the two candidates. But the election can still be won by a more progressive candidate if you can persuade people you've got a center core* they can understand and relate to and trust' .... [E]conomic conservatism is more important than social conservatism, he said. "The new politicians of the South are [not] birds of a feather.... Rather, they are competitors for control of a region whose political future is, more than almost any other part of the nation, up for grabs in the Eighties and Nineties." "On the surface, the populist Democrats like Clinton seem at the opposite pole from the conservative Republicans like ... [Trent] Lott ..., who stress their criticism of the expanding role of the federal government.... But in reality, the voters ... seem equally receptive to either appeal.... What is important is simply that the candidate place himself on the voters' side against some of the big, unresponsive bureaucracies...."
"[T]he real change is that after the New Deal, the Fair Deal, the War on Poverty and the Great Society, the whole Democratic Party has retreated into conservatism." Alas, Pat Brown also thought that the conservatisim of Proposition 13 in California would be a passing fad. And former democratic Governor of North Carolina Terry Sanford and young democrat-turned-republican Mississippi Senator Trent Lott both swore that the issue of race in the South was over. "the corrosive effect of interstate competition for industry. ... [T]he economy has become more national, but the political system hasn't, so business can play the states off one against the other." But portentiously, Frank described himself as one of the few remaining leftist liberals. "The products of the 'baby boom'* [*actually, since most of the politicians interviewed were born before 1946, they were not Boomers] ... are all rebels against ... [bureaucratic] mass culture and huge institution.... The bipartisan drive for deregulation of the economy and decentralization of the government decision making is a secular force that seems almost certain to gain momentum as this generation gains power. Even now, two generations later, as we have seen that when you take economic equity for granted it goes away, Chuck Schumer in 2016 and Mark Penn this year have continued to laud a strategy grasping for suburban Republicans and eschewing the traditional Democratic urban working class. As it turned out, bill Clinton had the priorities of voters fundamentally wrong: social conservatism was categorically more important to a critical mass of (especially white Southern) voters than economic conservatism. But the ideology that Bill Black spoke of in June was already flowering 40 years ago -- the turning away from traditional Democratic power centers, and from broad government programs anchored in economic populism, in favor of social issues and a commitment to lower taxation and more efficient fiscal prudence -- espoused by a group that grew up in the post-war middle class suburbs and sought to appeal to those suburbanites first and foremost, taking for granted that the broad prosperity that those programs forstered would continue.